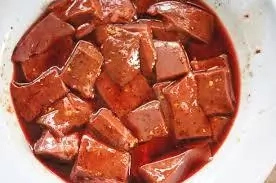 Liver as it is called is gotten from the part of a beef and used to prepare a special stew called the liver stew. 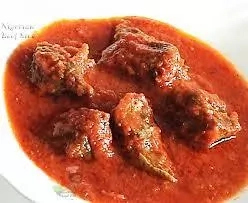 Liver stew is served in almost all the eating houses in Nigeria, like the restaurants, hotels, fast food joints, buka, careen,etc. Liver stew is mainly served with hot rice and it is very delicious. This article will help you to know how to prepare your own liver stew right from your very kitchen. Garlic is used in the preparation of liver stew, It is highly nutritious and gives the food that palatable and classic taste. Garlic is applied at different stages in the cooking of liver stew. When applying garlic to your dish you first peel off the outer layer by using a clean knife to gently peel it off. After you must have peeled it off, you wash the peeled garlic thoroughly, then you either chop it or you blend it to your taste. Garlic has a very pungent or strong taste , so when applying it to your dish should be moderate enough not to over add it so that it will not over shadow the taste of other ingredients used in cooking the food as well. Thyme is used as seasoning ingredient in preparing liver stew. It gives your liver stew that classic taste and aroma, though care should be taken not to over – apply it, otherwise it will suppress the taste of other ingredients used in cooking the liver stew, so when applying it should be done with caution because too much of a particular thing spoils the food no matter how sweet it is. In order words, thyme should be applied moderately in cooking liver stew. Chili pepper is another ingredient required in the preparation of liver stew. It used to prepare liver stew because amongst all other species of pepper, chili pepper happens to be the best suited for this kind of dish. However, care should be taken when using it, as it sometimes contains some level of sand in it, and so when using it make sure you clean thoroughly. Curry is yet another seasoning ingredient used in the cooking of liver stew. Itis used alongside with thyme. Curry gives liver stew that appetizing and delicious aroma. Curry comes in different forms, like the fresh curry leaf and the ground processed curry powder. Though the ground curry powder is easier to preserve, as it can stay in its powdery form for years, until it expires. The fresh is fresher in taste and more nutricious than the powdery ones , as they are gotten direct from nature itself. But the problem with the fresh ones is their preservation. 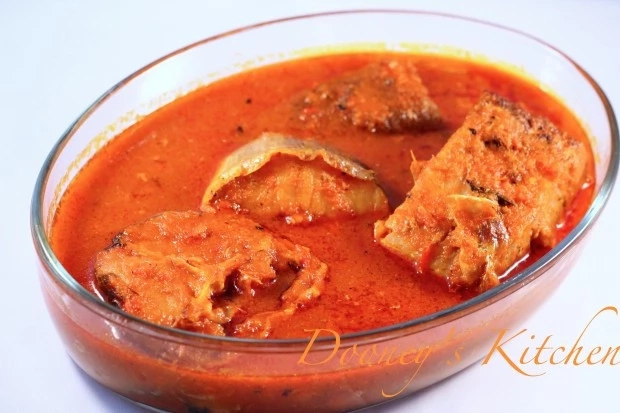 It is then advised that for you to enjoy the fresh curry to the fullest, you must use it or apply it immediately in your dish at once or if you have a refrigerator with constant power supply, you put it in your refrigerator for for the next cooking, as the case may be. Just like you find in other dishes, onions is vital in cooking liver stew, it makes the stew or it gives the stew that sassy taste. Onions can be put more than one times in the course of cooking the stew. It can be put intermittently as the cooking goes on. Without it liver stew may not be that enjoyable to the mouth because it will not be that tasty as you expect it to be, despite the presence of these other ingredients. The white onions is mainly used in preparing such dishes such as liver stew, jollof rice, different types of stews including kidney stew, etc, while the red ones are used mainly in preparing different types of soups. Every onions is first peeled to remove the outer cover, then after removing the outer cover , you then wash it thoroughly and chop it or slice it, or you may prefer to blend it as the case may be. Onions is an important ingredient in every dish that should not be overlooked.. This is another essential ingredient in cooking liver stew, it is used in frying some of the ingredients, and as well producing that oily delicious effect in every liver stew. Though there are so many groundnut oil oils that can be used to cook liver stew, such as, soya oil, (gotten from soya beans), we also have vegetable oil, like the popular Kings vegetable oil, Turkey vegetable oil, and so many of them you can find in the market. Though i would like to advise you to go for the less fatty ones, that is the ones low in cholesterol, especially for the sake of hypertensive consumers or guest that will like to enjoy the food without being exposed to the risk of increasing their blood pressure. Tomatoes is another delightful ingredient in the preparation of liver stew,it serves as the main colorant in the liver stew. The presence of tomatoes is what makes it a liver stew. Tomatoes can be applied as fresh tomatoes puree or as processed tin tomatoes puree, whichever one you choose,tomatoes generally gives every stew that sweet delicious taste and looks. It is very nutritious as well because it contains a high level of vitamin A. Tomatoes can be taken raw or cooked or fried. It can be chopped or made to be in puree form. Below are the list of the entire ingredients and their quantity required to prepare liver stew. c. Heat up half of the oil in a pan and fry the cooked liver until brown but not too dry.in another pot, heat up the rest of the oil and fry the ground onions, chilies and tomatoes for 20 minutes, until fairly dry. d. Add the tomatoes puree and some stock, if required. e. Stir thoroughly and add the fried liver pieces. f. Cook and simmer gently for another 10 minutes, stirring frequently until well blended. g. Drain off excess oil that rises to the top and finally stir in the chopped part minger leaves. h. Remove from fire and serve with hot rice and fried plantain.